Gautama Buddha, the historical Buddha, lived between 563 and 483 BC in the area known now as the Indo-Nepalese region. As a bodhisattva, he had passed through thousands of existences before coming to Earth for his ultimate transmigration. This last lifetime he began as a son of the King of the realm Sakya, Sudhodana, who ruled at Kapilavastu, in Ancient India on the border of present-day Nepal, and was born in a village called Lumbini into the warrior tribe called the Sakyas (from where he derived the title Sakyamuni, meaning "Sage of the Sakyas"). According to ancient tradition, Queen Maya, his mother, first had a dream of a beautiful white elephant coming down into her womb, and this was interpreted as a sign that the Buddha, or a universal emperor, was about to be born. When her time came, Queen Maya went into the garden and gave painless birth to the bodhisattva. He immediately walked, spoke, and was received by Brahma. Five days after his birth, the young prince received the name of Siddhartha. When his parents took him to the temple, the statues of the gods prostrated themselves before him, great were the rejoicings of the people over the birth of this illustrious prince. Also at this time a devout old man named Asita came down from the Himalayas to meet the newborn prince. An ascetic of high spiritual attainments, Asita was particularly pleased to hear this happy news. Having been a tutor to the King, he visited the palace to see the royal baby. The king, who felt honoured by his unexpected visit, carried the child up to him in order to make the child pay him due reverence. To the surprise of all, the child's legs turned and rested on the matted locks of the ascetic. Instantly, the ascetic rose from his seat and recognizing in the young child the 80 signs that are pledges to a highly religious vocation, and foreseeing with his supernormal vision the child's future greatness, saluted him with clasped hands. The Royal father did likewise. The great ascetic smiled at first and then was sad. Questioned regarding his mingled feelings, he answered that he smiled because the prince would eventually become a Buddha, an Enlightened One, and he was sad because he would not be able to benefit from the superior wisdom of the Enlightened One owing to his prior death and rebirth in a Formless Plane. After seven days Queen Maya died, and her place as mother was taken by her sister, whose devotion and love became legendary. When the young prince was in his twelfth year, the king called the wise Brahmans in council. They revealed that Siddhartha would devote himself to asceticism if he cast his eyes on age, sickness, or death ~ and, if he were to meet a hermit. Wanting his son to be a universal monarch instead, the king surrounded the palace with a triple enclosure and guard and proclaimed that the use of the words death and grief were forbidden. The most beautiful princess in the land, Yasodhara, was found for his bride, and after Siddhartha proved himself in many tournaments calling for strength and prowess, when he was 16, the two were wed.
Siddhartha was kept amused and entertained for some time by this privileged life behind the palace walls until one day his divine vocation awoke in him, and he decided to visit the nearby town. The king called for everything to be swept and decorated, and any ugly or sad sight to be removed. But these precautions were in vain for while Siddhartha was travelling through the streets, an old wrinkled man appeared before him. In astonishment the young prince learned that decrepitude is the fate of those who live life through. Still later he met an incurable invalid and then a funeral procession. Finally heaven placed in his path an ascetic, a beggar, who told Siddhartha that he had left the world to pass beyond suffering and joy, to attain peace at heart. Confirmed in his meditation, all these experiences awakened in Siddhartha the idea of abandoning his present life and embracing asceticism. He opened his heart to his father and said, "Everything in the world is changing and transitory. Let me go off alone like the religious beggar." Grief-stricken at the idea of losing his son, the king doubled the guard around the walls and increased the pleasures and distractions within. And at this point, Yasodhara bore him a son whom he called Rahula (meaning "chain" or "fetter"), a name that indicated Gautama's sense of dissatisfaction with his life of luxury, while the birth of his son evoked in him much tenderness. His apparent sense of dissatisfaction turned to disillusion when he saw three things from the window of his palace, each of which represented different forms human suffering: a decrepit old man, a diseased man, and a corpse.Yet even this could not stop the troubling thoughts in his heart or close his eyes to the realizations of the impermanence of all life, and of the vanity and instability of all objects of desire. His mind made up, he awoke one night and, casting one last look at his wife and child, mounted his horse Kataka and rode off accompanied by his equerry Chandaka. At the city gates Siddhartha turned over his horse to Chandaka, then he cut off his hair, gave up his sumptuous robes, and entered a hermitage where the Brahmans accepted him as a disciple. Siddhartha had now and forever disappeared. He became the monk Gautama, or as he is still called, Sakyamuni, the ascetic of the Sakyas. For many years Gautama studied the doctrines until, having felt the need to learn more elsewhere, he traveled and fasted. His two teachers had showed him how to reach very deep states of meditation (samadhi). This did not, however, lead to a sense of true knowledge or peace, and the practice of deep meditation was abandoned in favour of a life of extreme asceticism which he shared with five companions. But again, after five or six years of self-mortification, Siddhartha felt he had failed to achieve true insight and rejected such practices as dangerous and useless. Resolved to continue his quest, Siddharta made his way to a deer park at Isipatana, near present day Benares. Here he sat beneath a tree meditating on death and rebirth. Discovering that excessive fasts destroy strength, he learned that as he had transcended earthly life, so must he next transcend asceticism. Alone and weak, he sat beneath the sacred Bodhi tree of wisdom, and swore to die before arising without the wisdom he sought. Mara, the demon, fearful of Gautama's power, sent his three beautiful daughters to distract him. When that failed, Mara sent an army of devils to destroy him. Finally Mara attacked Gautama with a terrible weapon capable of cleaving a mountain. But all this was useless, and the motionless monk sat in meditation. It was here that Siddharta attained a knowledge of the way things really are; it was through this knowledge that he acquired the title Buddha (meaning "awakened one"). This awakening was achieved during a night of meditation, which passed through various stages as the illumination that Gautama had sought slowly welled up in his heart. He knew the exact condition of all beings and the causes of their rebirths. He saw beings live, die and transmigrate. In meditating on human pain, he was enlightened about both its genesis and the means of destroying it. In this first stage he saw each of his previous existences, and then understood the chain of cause and effect. In the second he surveyed the death and rebirth of all living beings and understood the law that governs the cycle of birth and death. In the third he identified the Four Noble Truths: the universality of suffering, the cause of suffering through selfish desire, the solution to suffering and the way to overcome suffering. This final point is called the Noble Eightfold Path, this being eight steps consisting of wisdom (right views, right intention) ethics (right speech, right action, right livelihood), mental discipline (right effort, right mindfulness, right concentration), which ultimately lead to liberation from the source of suffering. 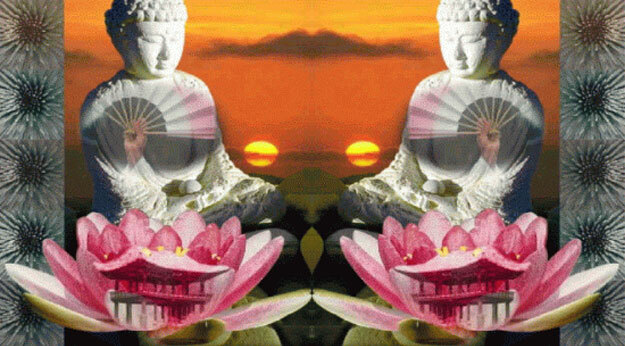 When day came, Gautama had attained perfect illumination, and had become a Buddha. The rays emanating from his body shone to the boundaries of space. He stayed in meditation for seven more days, and then for four more weeks he stayed by the tree. Through his process of enlightenment he discovered that all sentient beings in this universal life possess buddhahold, and all are future potential buddhas. From that time he had two alternate paths: he could enter Nirvana immediately, or else he could stay and spread enlightenment. After Brahma came in person to beg him to preach the law, Buddha yielded and stayed on the earth. For many years he traveled and taught his wisdom about the force of love and the destruction of all desire. Although initially hesitant to share his insight on the grounds that humanity might not be ready for such a teaching, the Buddha decided to communicate his discovery to those willing to listen. His first converts were the five ascetics with whom he had lived when he himself followed the lifestyle of the ascetic. To these he preached his first sermon in the Deer Park at Benares, outlining to them the Four Noble Truths. Out of this small group the community of monks (or Sangha) grew to about 60 in size and came to include Buddha's cousin, Ananda, and his son, Rahula. 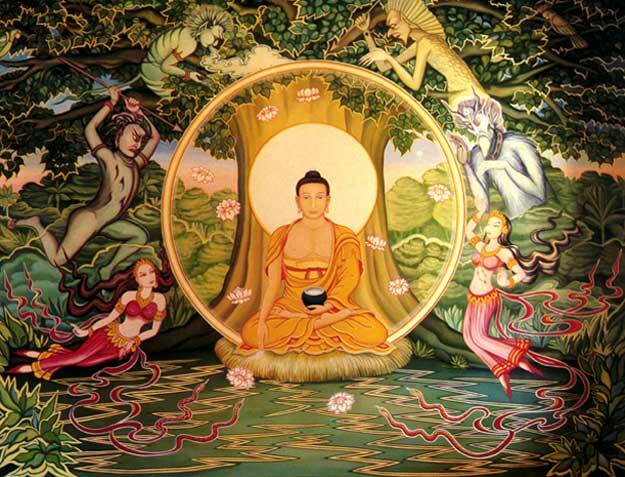 Later the Buddha was persuaded by his stepmother and cousin to accept women into the sangha. The remaining 45 years of the Buddha's life were spent journeying around the plain of the Ganges, teaching and receiving visitors. "There are two extremes which are to be avoided: a life of pleasure ~ this is low and ignoble, unworthy and useless, and runs counter to the affairs of the spirit; and a life of fasting ~ this is sad, unworthy and useless. Perfection has kept its distance from these two extremes, and has found the middle way which leads to repose, knowledge, illumination, and Nirvana. So here is the sacred truth about pain: birth, old age, sickness, death, and separation from that which one loves, are pain. And this is the origin of pain: it is thirst for pleasure, thirst for existence, thirst for impermanence. And here is the truth about the suppression of pain: it is the extinction of that thirst by the destruction of desire. "Charity, knowledge and virtue are possessions that cannot be lost. To do a little good is worth more than accomplishing works of a difficult nature. The perfect man is nothing unless he pours out kindness on his fellow creatures, unless he consoles the abandoned. My doctrine is a doctrine of mercy. The way of salvation is open to all. Destroy your passions as the elephant would trample down a reed hut. But I would have you know that it is a mistaken idea to believe that one can escape from one's passions by taking shelter in hermitages. The only remedy against evil is healthy reality." And so Buddha travelled and preached. He performed many miracles, and converted his family and many followers. During his life the Buddha had taught that no one was to succeed him as leader of the Sangha. Instead, his followers were to take his teaching and rule as their sole guides. By the time he reached the age of 80, Sakyamuni began to feel old. He visited all of the monasteries he had founded and prepared to meet his end. Before the Buddha's death, he became severely sick. He journeyed northwest to the banks of the river Hiranyavati, walking with his disciples, and ate the food offered by a blacksmith. His illness had progresses, and at the end, he came to the river and took a bath. Then he made a rope bed among eight sal trees, with each direction having two. He lay down on his side, right hand supporting his head, the other resting on his body. All later reclining Buddhas (called Buddha's Nirvana) are in the same posture. Growing weaker, he spoke one last time: "Do not say we have no master now. The doctrine I have preached will be your master when I have disappeared. Listen, I beg you: ALL CREATIONS ARE IMPERMANENT; work diligently for your liberation." Having pronounced these final words, Buddha went into the jhana stages, or meditative absorptions. Going from level to level, one after the other, ever deeper and deeper, he reached ecstacy. Then he came out of the meditative absorption for the last time and passed into nirvana, leaving nothing whatever behind that can cause rebirth again in this or any other world.and finally passed into Nirvana. After his death, Buddha's remains were cremated, as became the Buddhist tradition. The passing away, or the final nirvana, of the Buddha occurred in 483 BC on a full moon day in the month of May, known in the Indian calendar as Wesak.